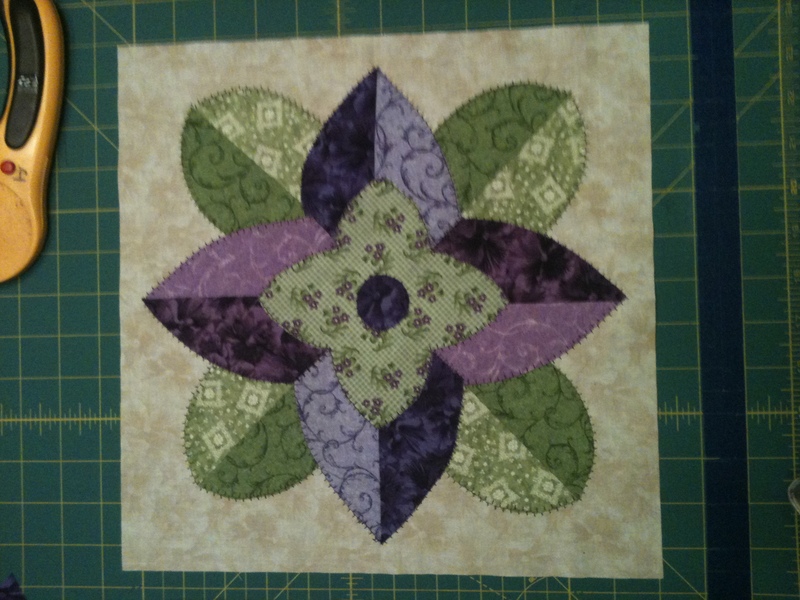 I'm working on a pattern that called for needle turn applique. Since I've never done that, but I have done raw edge I did that instead. I had to adjust in places to make pieces meet neatly, but ... what else would determine whether these techniques are interchangeable? My pieces are large and not detailed. The only things I changed were the size of the circle in the middle and the purple/plum pieces needed to meet at the seam in the leaf so I trimmed those edges. I hope the blanket stitch I used really secures these pieces, but my hand sewing lacks a lot so figure it worked as well as that would have. The background square is 12.5". I am the exact opposite I prefer needle turn. Next year it may have changed. As you can guess I do both and of the 2 prefer needle turn as I can sit and sew any time. I do love the block I can see no reason to think it is wrong it is beautiful. I think your block is lovely! Your stitches look amazingly uniform to me! I do both needle turn and raw edge applique. I was a hand quilter only until about 3 years ago.. I have done the technique where you sew like an interfacing to the applique piece, right sides together. Then u make a small clip in the interfacing part and turn the applique piece right side out. Presto...no raw edges, applique is ready to stitch. I also recently saw the technique where you use the interfacing, make sure it's fusible..putting the fusible side to the right side of the applique piece. Stitch around, clip curves if needed. Then make slit opening in fusible side and turn it right side out...the fusible will then have the sticky side out, ready to be fused to your block fabric then stitched. Lastly I have seen where people use used dryer sheets in place of the fusible..great idea for recycling! Again, love your block! Last edited by kiffie2413; 07-08-2013 at 12:17 AM. i think the final look that you want to achieve would be the deciding factor for the method used. if you don't want the stitches to show, you have to do needleturn. to me, this is a more finished/formal look. raw edge is a more casual/primitive look. both are great methods. I think your block looks great. I love your block. You did an awesome job with the appliqué. Your stitches look perfect! I also think it looks beautiful! Love the color and the shades of dimension it brings out. Your stitches are even and look great. Nothing wrong with that, I wish I could do it so nicely. You did great! I think whatever you choose is fine..... it's your quilt. I hardly ever stick to a pattern.... always changing something to make it like I want it.... and I never have had anyone say,..... wasn't that supposed to be something else??? So, don't fret about your choices..... just do what you want to do. I have done that last technique you described with the fusible interfacing...only on a couple of blocks for a BOM and on a few practice Sunbonnet Sues. I like the method. I've tried needle turn but wasn't pleased with my work. Jan, your block is beautiful. it looks very nice. as long as you've secured the edges you're good to go. As everyone has stated, your block looks great. Usually appl designed for needle turn has 1/8 to 1/4 turn under allowed whereas raw edge does not. You would cut away that allowance if changing to raw edge. Check your pattern to see if it has the extra allowance otherwise proceed as you are doing. I love your block! The colors are great. The pattern looks familiar. Designer? wow.. the block is beautiful! I've taken classes on both, but have not practiced enough... I plan on getting a project using each technique ready, THEN take the class, so I can get right to work on it! Your work is lovely!! Your block is beautiful and your stitches super even... I had a quilt I dithered about on for 2 years because I was not sure my stitches were ok. As others have said finished is better than perfection. I love your fabrics/colors. I am very drawn to those greens and purples at the moment. I think your block is beautiful. I love the colors. Love the Colors you used...! ! ! ! ! Friend who can share your laughter and tears are the only ones you need. That's a really good looking block! For me, the choice between needle-turn and machine applique would be the size of the pieces; if the pattern has any tiny and/or very pointy pieces that might not adapt well to machine applique, then needle-turn is the way to go. However, I'm thinking that McKenna Ryan has some really tiny pieces in her kits and I think that hers are all designed for machine applique. I prefer the interfacing technique, too. It's a lot quicker then turning each edge by hand, and I'm always afraid to do raw edge since i DON'T LIKE THE FRAYING even with the blanket stitch. I love your block and the colors! You can do appliqué that is sewn by machine but looks hand done by using an invisible thread and a very tiny blanket stitch. Karen Kay Buckley teaches this method. You prepare the pieces with the edges turned under by any of the methods metioned above or by the startch method. Then glue them to the background and go around with the machine. Looks great. Love love your colors and block. What is that pattern? also love theses appliquÉ methods. Read what the pattern was once again, love your colors!